If you struggle to keep your lawn or garden well-groomed with a standard mower, you may need additional tools or equipment. With the best walk-behind string trimmer that your budget will allow, you’ll be able to cut grass, weeds and brush that your mower can’t. When you have areas of your garden that are difficult to access, or where a normal mower is not going to be able to do the job, one of the most sensible solutions is a wheeled trimmer which you can walk behind. To help you understand what a walk-behind trimmer can do, and what features you should consider most, our buyer’s guide will highlight the most important ones, and help you to understand what to look for when considering which one to purchase. One of the reasons that you are likely to need a walk-behind trimmer is to cut grass, brush and weeds that your normal mower can’t handle. One of the considerations within that is the cutting height that a trimmer can offer you. Some will have a fixed height, but others will give you the ability to adjust that height within a range that is likely to be somewhere between 1.5 inches to 3.5 inches. 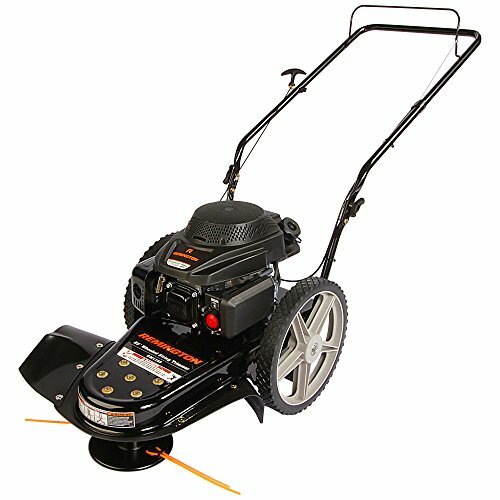 This is where you will find differences between walk-behind trimmers, as there are so many engine manufacturers, that supply engines for this type of garden tool. This tends to be the same on most of these trimmers with the standard being 22-inches. 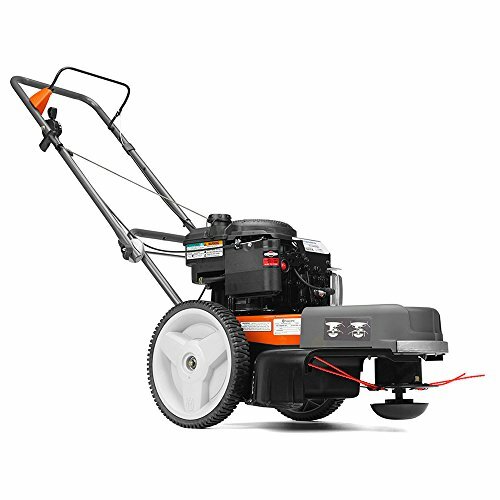 This means that the trimmer can cut to a diameter of grass and weeds of almost 2-feet across. It follows, that the bigger the wheel diameter on anything you are pushing, the less effort is required to move it over any distance. Therefore, the bigger the wheels on a walk-behind trimmer, the better. You will notice that there are not huge differences between various models in terms of their wheel sizes, but they do exist. On the lower end, you have wheels which are less than 12 inches in diameter, and others which are at least 14 inches. With the most likely reason for you to use a wheeled trimmer being to cut areas where a normal mower is not suitable, it is unlikely than that you are going to be pushing it along billiard table smooth lawns. It is far more likely that it will mean bumpy ground and areas where the grass and weeds are thick or tangled. For this reason, it is important to consider the fact that while it is cutting through all this foliage, you are the one that is going to be pushing the trimmer; you want that task to be as comfortable as can be, and with as little stress on your shoulders and other arm joints, as possible. Of the things to look for to help with this is an adjustable handle, so that it can be set at just the right height for you. Another is a cushioned grip, so that any vibration from the engine, or the trimmer’s cutting action, is reduced, and not impact too heavily on your arm joints. As with any garden equipment which runs from a gas-fueled engine, you must take account of the rules and regulations which are applicable where you live. Not only will there be limits set in terms of the allowed noise levels, you may find that this type of garden equipment is not permitted at all. This also applies to fuel emissions, which are obviously going to occur with gas powered engines. To be on the safe side, first, check what the noise and emissions regulations are, and then check whether the walk-behind trimmer you are considering, meets those rules. Some manufacturers will be up front and tell you if they are not, but don’t assume they all will. You should not lack any power when it comes to getting rid of grass, brush and weeds with this wheeled string trimmer, thanks to its 4-cycle 159cc engine. This should allow you, not only to get rid of even the most difficult of the weeds and long grass, but to do the whole job in less time too. Helping with the task of cutting down the grass, is the 22-inch cutting swath which incorporates a cutting string of only 0.155 inches. Being so thin allows it to cleanly cut through just about everything in its path, including thicker weeds. The wheels on this string trimmer are 14-inches in diameter with ball-bearings to ensure it moves smoothly. These enable you to move the trimmer easily and accurately, if you need to take it through garden features, or a manicured lawn. Your task of cutting the grass is made even easier thanks to being able to adjust the height of the cutting head. This means you can mow your lawn to whatever height you want it with your lawn mower, then set the trimmer to the height that suits this best. You can then tidy and trim the edges so that it is as close a match can be. Making sure you can use this trimmer comfortably as you are walking it, is an adjustable handlebar. You can set this to the height and angle which suits you best, thus avoiding backache or any strain in your arms. If you continually deal with weeds and overgrown grass in areas of your yard that your mower can’t reach, then this walk-behind string trimmer from Husqvarna, could solve that problem for you. At its heart, and driving the cutting head, is a Briggs & Stratton 190cc engine. 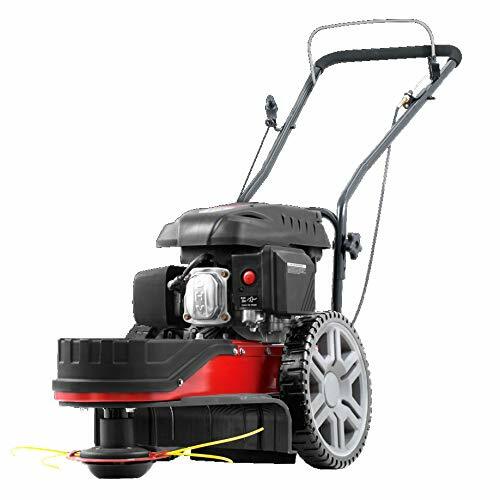 Briggs & Stratton power some of the most popular gardening equipment available, so it is a safe bet that this engine should be reliable and powerful enough to cut through the excess weeds and grass around the edges of your garden. To make that task easier, and to ensure that the edges of your lawn look as neat as possible, the cutting head can be adjusted between 1.6 inches and 3 inches. This gives you the means to be cut your borders and edges exactly how you want them. As with most string trimmers of this type, the cutting swath is 22-inches, allowing it to cut quickly and efficiently through as much grass and as many weeds as it can. On the subject of wanting to do things quickly, the machine has a very simple throttle control, which you can use to stop and start the cutting head, without having to restart the engine. You should find that this trimmer is very easy to start, and thereafter very easy to use too. This is aided by the adjusting handle which you can set at any angle or height that suits you. 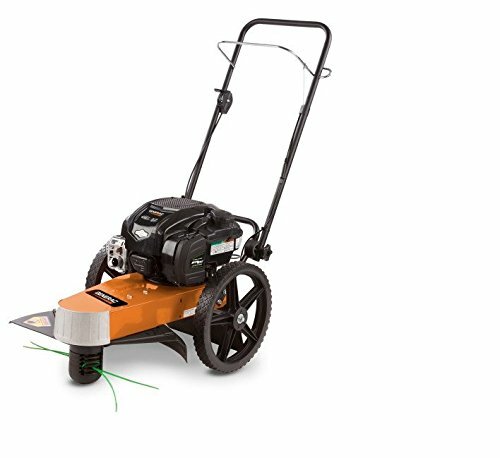 For those that may struggle slightly with maneuvering a heavier wheeled string trimmer, or if you just want one that is lighter, take a look into this one from Southland Outdoor Power Equipment. It weighs just 50 lbs. which in comparison to many similar trimmers, is upwards of 20 lbs. less weight to push around your garden. Lower weight does not mean poorer performance, because it is powered by a 150cc engine, that can create 5.75 lb./ft torque. This means it should be able to drive the cutting head and the string through even the toughest and thickest of weeds that your garden may have. The trimmer head has 22 inches of cutting swatch, so it should catch everything that you are moving the trimmer through. As you are pushing the trimmer along, the thick tread on the 12-inch tires will ensure that your progress is not hampered, even on wet, or soft ground. Starting the engine uses manual recoil, which incorporates a fuel delivery system to get the engine up and running as quickly as possible. If at any time while using the trimmer you want it to stop, simply release the control lever and the engine will stop immediately. On the handle, there is cushioning to help reduce the amount of vibration you experience when using the machine. The handle assembly can also be folded down when you have finished using the trimmer. This allows the machine to be stored neatly away until the next time you use it. One of the most common complaints about gas-powered garden equipment which require a manual start is how difficult that can be. Not only does it require quite a bit of effort, but it also wastes a lot of time, if it takes multiple attempts to start it. With this trimmer, Poulan Pro have utilized their own trademark registered ReadyStart system which is guaranteed to start within two attempts, and without the need for a choke, or any kind of priming. The engine also requires very little maintenance, with the only requirement being an occasional oil level check, and a top-up of that oil, if the level is low. The engine you will be starting using this system is from Briggs & Stratton. It has a powerful 6.75lb/ft torque which is generated from the engine’s 163cc capacity. All of this should ensure that even if you are trying to cut through your own mini-jungle, this trimmer will have all the power you need. If you are looking for a string trimmer that can be used on all sorts of terrain, then this one from Field’s Edge might be the one for you. 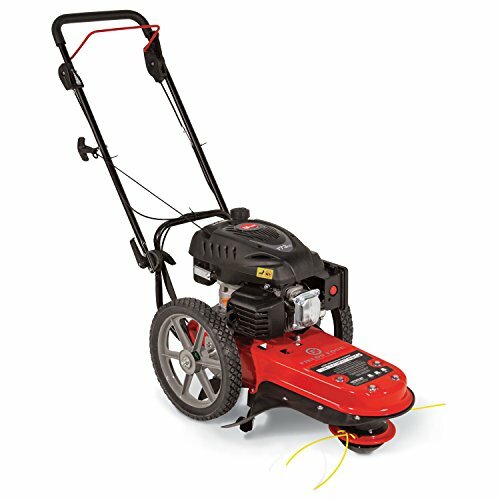 It is one of the more versatile trimmers and can be used for mowing, trimming, clearing brush, and cutting weeds. To allow it to do all that, you would expect it to have a powerful engine, and that is exactly what it has. It is a 173cc, 4-cycle engine which has a torque of 5.9 lb./ft. and starts using a manual recoil. The wheels on the trimmer are 14 inches in diameter, which helps you move it more easily around your yard or the area in which you are working with it. The wheels also have heavy-duty tread, so in wet, or muddy conditions, pushing it should not be that much more difficult than when the ground is dry. There are no surprises in respect of the cutting swatch, which is 22 inches, although the deck is one-piece, which gives it greater stability, and means there is less vibration felt when the trimmer is in use. The cutting head height is adjustable and can be varied from just 0.15 inches to 3 inches. The throttle control is built into the handlebar, and enables you to stop the cutting head spinning, without switching off the engine. This saves you a lot of time and effort, as you do not need to restart the engine every time you stop. When you have finished using this string trimmer for the day, it can be folded down, for easy storage. This manufacturer of this walk-behind trimmer appears to have found an ideal balance between a powerful engine to make cutting grass edges easy, and a machine light enough that most people will be able to use it without much physical effort. Let’s start with this trimmer’s weight, which at only 46 lbs., is one of the lightest we have encountered within this category of trimmers. When you consider that there are some gas-powered trimmers like this one, which weigh over 70 lbs., you’ll hopefully agree that is a significant difference. Thankfully, the lightness of this string trimmer is not achieved by powering it with a wimpy engine. In fact, its engine is up there with most others at 163cc capacity. This allows it to give you the power that you’d want to cut through thicker weeds, and denser brush if the need arises. Adjusting the cutting head is also an option on this trimmer, and it can be set to any one of 5 different heights between 1.5 inches, and 3.5 inches. If you ever get a bit too energetic with the trimmer and accidentally collide with a gate post or tree trunk, then fear not, as the front has a fortified aluminum plate, which protects it from bumps. This was as tough a category to judge which product comes out on top, as a lot of the specifications and features were very similar. However, we are going to award the best walk-behind string trimmer, to the Poulan Pro 961720015 High Wheel Lawn Trimmer. 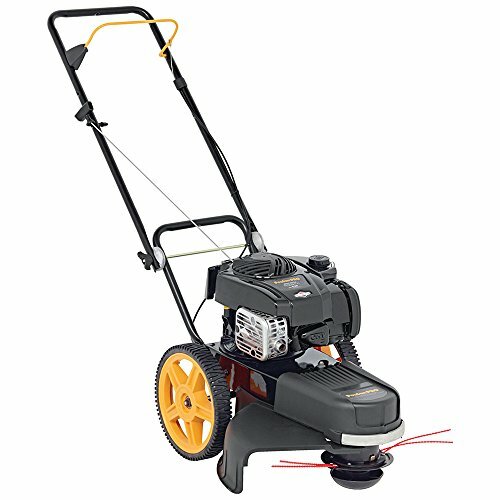 It has all the features you would expect to find such as adjustable cutting head height, 22-inch cutting range, and a powerful engine, which in this case is a 163cc capacity one from Briggs & Stratton, whose engines have an impressive reputation for quality and reliability. What tipped this trimmer in to the No. 1 spot, was its easy starting procedure, and that the amount of maintenance required for this product is very limited indeed. Whenever a product is made easier and simpler to use, it is going to impress us, which this did in this, and many other ways.